Pros: - Got six. Created RAID 5 and RAID initialized successfully. This is sort of a first test for the drives. Copied a few TB of backups on it which went without a hitch. - Performance. A hair better than HGST 6TB NAS drives that I own as well. 212 MB/sec sequential Read and Write on the outer most track and (half of that) 100 MB/sec on the innermost track. 170 MB/sec AVG sequential read. - Enterprise. For the price I had a choice, go with the proven HGST 6TB NAS, get IronWolf Pro 6TB or these. I figured, I'm going to give an Enterprise drive a try and see if it is in fact better than consumer/NAS drives. Now I have to wait 5-6 years until I can reach a conclusion. - July 2016 manufacture date with August 2021 warranty expiration. For a drive that came out in middle of 2014 I was worried that the stock will consist of old drives and that I would lose a year of warranty as a result. Mid 2016 is acceptable. - Noticeably quieter than my HGST 6TB NAS drives under load/seek. Quiet random seek - this usually is the loudest operation. This measure is always subjective, but I think many will find these to be very quiet. For the past two weeks I've been moving data between RAID sets which equated to a lot of TBs written to and read from these drives in total. I'm very happy with them, just wish they had ISE. Cons: - This model does not have SED (Self-Encrypting Drive) / ISE (Instant Secure Erase). This is a slight bummer as it is a useful feature when you can't zero out the drive before disposing of it when it goes bad. I was convinced these have it when purchasing. Refer to Seagate website for the models from this series that do support ISE. Other Thoughts: - Seagate Advanced Return, when drive in warranty. Seagate ships replacement (refurbished) drive before receiving the defective drive. Very useful when a drive fails and you want to get the RAID back up to full functionality. I've made use of Seagate and WD Advanced Returns in the past and was pleased with the process. Based on my experience with many drives, if a drive does not fail in 1 month (I usually keep additional backups for 3 months when moving to new drives) then it has no manufacturing defects and when it fails after that, then it will be due to use. I bought these because my old drives started to fail slowly; 2 of 5 drives that I was using for almost 6 years failed on me in the same month! RAID 5 was there to save me, though RAID is not a substitute for proper backups. In total 3 of the original 5 WD drives failed, the first one back in late 2015 (just days from expiration of the 5 year warranty so I got a free refurbished replacement that is still going strong :) ) and the following two in January 2017. - Expertly packaged. Each drive in it's own OEM box. Funny thing is that the inside of the individual boxes said WD (Western Digital). - Customer service. Needed price adjustment and NewEgg was there to help me out. Pros: Three out of four drives worked. Not bad odds for horse shoes. Not cool for hard drives. Cons: Immediate denial of return request. Cons: We had a bad drive and they took very good care of us and got the replacement out quickly! Cons: The drive arrived today and I immediately ran Seagate SeaTools on it to check the drive history. Lifetime Bytes Read is 11.98TB and Lifetime Bytes Write is 17.42TB. Power On Hours is 3,297 hours (137 days continous)! Speechless. Other Thoughts: This should have been clearly labeled as a used drive! Cons: bought 7 of these drives, 3 were DOA with faults detected straight out of the box. 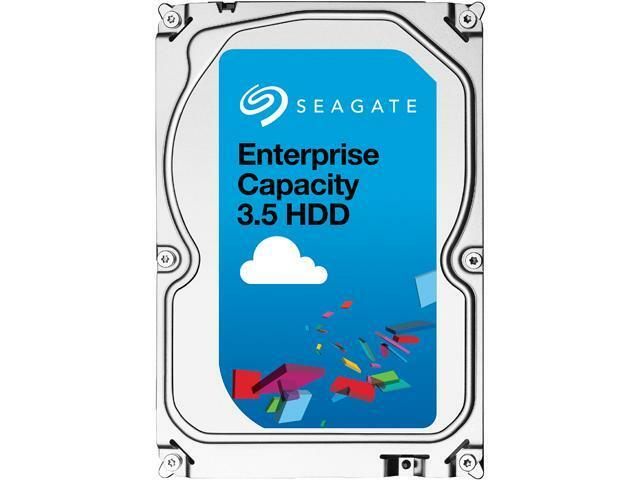 Other Thoughts: Thought I would play it safe and buy an enterprise class product for a couple hundred dollars more each drive instead of the WD red drives. I was wrong. returning the batch and getting WD Reds and saving my self fourteen hundred bucks. Pros: Huge hard drive! Drive works flawlessly and did so right out of the box. Drive is fast too. Sturdy construction, feels very solid and heavy duty. Plugged into my home security DVR system and it worked perfectly without any special format and registered all the available storage space imidiataly. It's a Seagate which have always been reliable in my experience. Cons: Expensive drive, $600 is quite a bit of cash to come up with for a single component but it is a 6TB so cant really argue with it too much. This drive is a bit noisy as you can hear it crunching data. Gets quite hot if you don't have adequate airflow around it. - 1.4 Million hrs - mean time to failure (MTBF), this should serve you with plenty of spare time, works out to 142 years which should last a few generations. I guess only time will tell how reliable the drive really is. - This is a high workload drive designed for servers, if you looking for a high capacity drive for storing non critical files etc get a cheaper regular drive if you're on a tight budget. -I got 208MB/s read speeds on average of 5 runs with ATTO drive benchmark tool, very impressive for a mechanical drive !! - Drive is very pricey, you pay what you get though so for a 6TB enterprise drive the price is fairly reasonable, the loss of data has a much higher price, in the case of family pictures you cannot put a $ value to it. - 7200 RPM, would have liked to see 10k RPM for a higher end drive. - Still nowhere near the speeds that you get with a SSD, with prices on SSD's coming down a $200 mechanical drive is not such a great deal in my opinion. That said for a 1TB enterprise drive you will have to fork out $2-6k, that is some serious cash. A 1 TB regular MLC SSD will cost you around $500 at the time of this review. - Drive came un-formatted, not a big deal but still a minor annoyance, I do not like extra work. Other Thoughts: The brown Newegg box arrived promptly as always via UPS. The drive came OEM in other words it came bubble wrapped in an anti-static plastic outer box instead of a retail box, so no details or info on the drive, not a big issue as most drives these days come OEM style unless you buy it at a brick and mortar retail outlet, then you pay at least 30-40% more. Read - 172 MB/s, Write - 168 MB/s. 6 out of 14 people found this review helpful. Did you? Pros: I wanted to post an update for those who may be looking at this for home use. This worked great under WHS2011 and continues that with Win8.1 Pro 64bit... no surprise there. Cons: Price is difficult to stomach, but this is an Enterprise class drive and it shows. After updating to iRST 12.9, averages (3 runs) improved to Write 213,044 Read 213,189. When I tested this on WHS2011, I was using iRST 12.5. Make sure you're using the latest drivers for your setup to get the most out of this thing. I didn't use Storage Spaces on Win8.1 Pro 64-bit because a pool of 9GB had 4GB of usable space in Mirror mode. I need a bit more space for all my clutter than 4GB, so that effort is delayed a little bit.